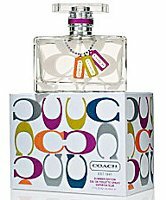 Fresh, charming and elegant, Coach Eau de Toilette Summer Edition celebrates modern beauty with a wink of playfullness [sic], a heart of pretty genet and an impression that wraps you in smooth, comfortable warmth. Playful fruity notes of mandarin, fresh raspberries and luscious guava NaturePrint® impart a joyfully juicy sparkle. Flirty freesia, marigold and violet leaves leaves round out the fruits with layers of light texture. OK, that’s pretty cute. I like the original, would be interested to at least sniff the summer version. We’ll see if it even gets anywhere near my local Macy’s, though. They’ve done a great job with packaging. So far, have not been as impressed with the fragrances. It’s so hard to judge a fragrance just from the list of notes. I’ve so often made big mistakes reading just the notes. Guava can add depth, or it can have a distinctive “medicine cabinet” smell. Luckily, there’s a store nearby, so sniffing is easy. There was guava in the original too. I did not love that one so will skip this one. Haven’t tried any fragrances from Coach yet at all. This bottle is awfully cute – so willing to sniff a sample. But not going to get excited about it by the sounds of all that fruit. The original was fruity, but not so sweet as you’d expect. The bottle is cute but I am a bit tired of the flankers.I only liked the original Coach edp I really disliked Poppy. Love the bottle (and often the handbags as well!) but haven’t loved, or really even liked the scents so far. But I’ll sniff this when I see it, though it sounds a bit fruity for my taste. I agree that the bottle is really cute, especially those tags. I absolutely love this new fragrance. It’s like they took the best part of the previous three fragrances and put them all in one. The bottle is cute. I just wish it was more original. Over all it’s going to be a great summer fragrance.